According to the Washington State Department of Transportation, trucks move an estimated of $42 million of freight on Washington roads each hour. With our busy highways, injuries and deaths from commercial trucking accidents are a serious risk to those that share the road. Unlike other vehicles, large commercial trucks are difficult to stop, and carry heavy loads. Commercial truck drivers may be fatigued, tired, or fall asleep while driving. They may be under the influence of alcohol or drugs. They may be distracted by telephones or texting while driving. Semi-truck drivers may fail to properly secure their load, causing accidents when their loads fall into the highway or interstate. They may be driving too fast for conditions or following other drivers too closely to stop. When crashes occur, the consequences tend to be more severe than other types of motor vehicle collisions. Heavy commercial trucks that jackknife in roads, perform unsafe lane changes, have inadequate reflective markings, or otherwise cause accidents can seriously injury or kill the passengers of other vehicles on the road or interstate. By holding negligent or reckless truck drivers and trucking companies accountable, we seek full compensation for our clients and hope to make our highways and interstates safer for the traveling public. Following a commercial trucking collision, the truck companies will send out investigators to interview witnesses, photograph the scene, and begin an investigation into the crash. When you or a family member is seriously injured or killed in a collision with a truck, a prompt and comprehensive investigation will be important to finding the cause of the crash and holding the trucking company accountable for your injury or the death of your family member. You need a law firm that has the skill, experience, and resources to conduct a careful investigation into the crash and seek compensation for your injuries and damages. At Kraft Davies, PLLC, we represent people injured or killed in collisions involving commercial trucks, semi-trucks, and tractor-trailers. We understand the issues involved and how to effectively prosecute claims against large trucking companies for injuries and deaths caused by the negligent or reckless acts of commercial truck drivers. Depending on the facts of your case, we may work with an accident reconstructionist, we may retain an expert in commercial truck driving to testify concerning the errors made by the truck driver, and we may consult with experts concerning weather issues. The trucking industry is heavily regulated by the U.S. Department of Transportation, Federal Motor Carrier Safety Administration. The Administration has comprehensive regulations on training requirements for commercial truck drivers, keeping records of the amount of time that truck drivers operate, the use of controlled substances, and many other issues. Similarly, the State of Washington imposes additional rules on truck drivers and trucking companies. Did the truck driver in your case violate these rules? In building a liability case, we will look for specific rules or regulations that were violated by the trucking company or its driver. We will speak with your doctors about the nature and extent of your injuries and may consult with vocational experts about your post-injury employment options and economic experts to calculate your economic losses. Whether your commercial trucking collision occurred on Interstate 5 (I-5), Interstate 405 (I-405), Interstate 90 (I-90), Interstate 84 (I-84) or elsewhere throughout Washington State, our experienced personal injury lawyers are ready to help you find accountability and the financial resources you and your family need. We offer a free case evaluation throughout the state of Washington. Whether you live in Seattle, Tacoma, Spokane, Everett, Olympia, Vancouver, Bellingham, Yakima, or elsewhere, we offer a free evaluation of your claim so that you and your family can decide how to proceed. 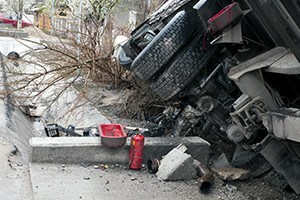 What Should You Do if You are in a Trucking Accident? Don't give a statement to the trucking company or its insurance company without the advice of a lawyer. You are not required to give a statement and the insurance company or trucking company will try to use the statement against you later. Get the name, drivers' license number, address, employer, license plate number, and other contact information for the driver. If you are taken from the scene in an ambulance, try to obtain a copy of the police investigation of the incident. Obtain the names, addresses, and telephone numbers of witnesses to the incident or other people that have relevant information. Take photographs of the scene, if possible. These photographs may be important in explaining the collision and may provide other helpful information. Make certain that any tire or skid marks at the scene are preserved or proper measurements are taken for use in later proceedings. It is important that you seek proper medical evaluation for your injuries and that you explain all your symptoms to your doctors so that they can properly treat your injuries. Keep a record of the names, addresses, telephone numbers and areas of practice for each medical provider that you see for your injuries. Keep a record of your lost time from work, including the number of days you missed from work and the earnings you lost. Get a copy of your automobile insurance policy. You may have coverage like personal injury protection (PIP) or wage substitution that may be helpful while you are recovering. Seattle, in King County, is the major metro area in Washington. Heavily traveled routes in the area include Interstates 5, 90, and 405 (I-5, I-90 and I-405). Heavy congestion, bad weather, steep grades and floating bridges over the lakes are all risk factors that may contribute to truck accidents. Tacoma, in Pierce County, is also a major metro area in Washington with a large industrial sector. I-5 runs through this city, which is a transportation hub for trucking traffic and port traffic in the area, including logging trucks and cargo trucks. Everett, in Snohomish County, on the northern edge of the Seattle metropolitan area, is also accessible by I-5 and can be congested with traffic from the Boeing Company plant and Naval stations in the area. In addition, trucks traveling to or from eastern Washington via Highway 2 often travel through Everett where Highway 2 intersects with I-5. Bellingham, in Whatcom County, offers access for trucks crossing the Canadian border as one heads north along I-5. Spokane, in Spokane County, is a point along the route for east-west I-90 trucking. The city is linked to the Tri-Cities (Richland-Kennewick-Pasco) by U.S. Highway 395, which links with Interstate 84 (I-84) heading west to Portland, Oregon. Vancouver, in Clark County, across the Columbia River from Portland, is often the scene of traffic congestion due to rainy and foggy weather, and the abundance of logging trucks in the area. Olympia, the state capital in Thurston County, is another point along the I-5 trucking route which sees major freight traffic. Yakima, in Yakima County, can present driving challenges in snowy weather. Agriculture in the area results in an abundance of trucks delivering crops, livestock and machinery on roads in and near Yakima.